Repairs For High End Acoustic Instruments. Lets face it so that we can deal with it properly, high end acoustic instruments are fragile, and the more you play them the better they sound, but they then are more likely to need repairs sooner rather than later. 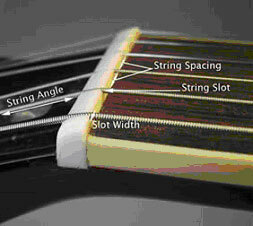 Acoustic stringed instruments are mostly made of wood and glue - when you figure in that steel strings, whether the number is four, six, eight, or twelve, it doesn't matter - steel strings tuned correctly or incorrectly, or in some alternate tuning - they create stress on an instrument mostly made of pieces of wood glued together. Acoustic stringed instruments whether they be cheap ones or very fine ones are all subject to the stress applied to them by the strings on them, but that's not all that they are subject to - they are also subject to heat, to cold, to humidity, and to human stupidity. When you combine high tension steel strings and excessive heat to an expensive acoustic instrument - you often get a disastrous outcome. 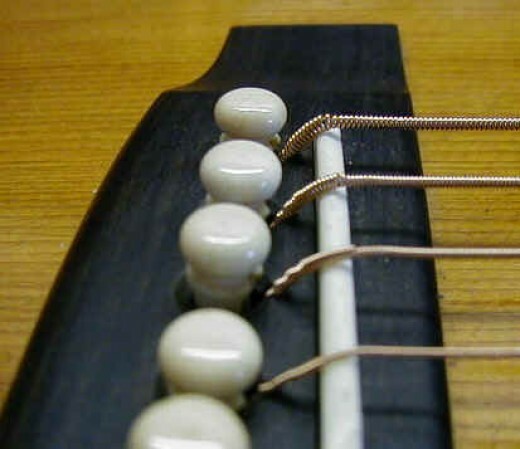 Heated wood glue softens in heat, and the steel strings can cause the neck to warp, the sound board to warp, or the bridge to lift up off the top of the instrument. Cold causes other problems. Excessive dryness causes still others, and excessive humidity causes others still. These are all problems that happen, but can be avoided. The problems associated with acoustic instruments doesn't end with the string stresses, the elements, and foolishness though - playing acoustic instruments daily can just wear parts of them out regardless of how much you care for them, and how well you go about caring for them. It's similar to automobiles - if you love your car or truck, it doesn't matter, you know that if you drive it then it will most certainly need repairs at some point in time. Frets on guitars, mandolins, banjos, and any other fretted instrument don't serve the function of letting you know where you are in regards to which notes you wish to make, that's a secondary function of frets - what frets do is allow you to make those notes in the first place. Yes, of course fiddles or violins don't have frets - those things are played with bows, not fingers or picks. I'm certain there's more to it than that, and I'm certain that it's not relevant to this article. 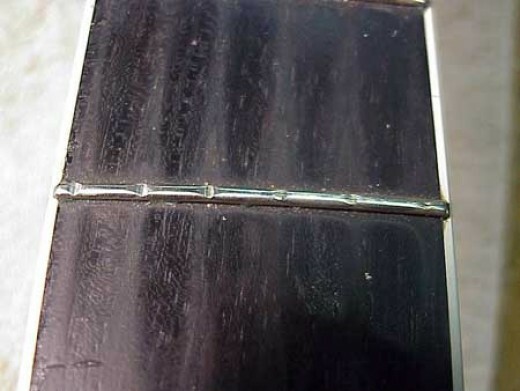 In the picture above you can clearly see a fret board on the neck of a guitar without the strings on it, now look closely at the FRETS the metal pieces going across the fret board, do you see the deep dents in those frets? That just happens - it happens because steel strings are being pressed against the frets in order to make notes, and the more a guitar is played, the more damage naturally occurs to the frets. When the frets get dents in them so deep that the string can't be properly depressed and allowed to ring the guitar starts making buzzing sounds that are very unlike the sounds that the player desired when he fretted the note in the first place. those frets must be replaced, my friend. The above picture is of a guitar's nut - feel free to imagine that as a banjo's nut, or a mandolin's nut. Feel free to realize that there are also loads of other acoustic instruments that have strings and nuts, and that I'm not going to make any sort of attempt to list them all here. I'm presupposing that should you know what a banjo is, a guitar is, and a mandolin is - that you can and will see all similarities shared with less known instruments such as the mandocello, the Irish bouzouki, and the rest. Typically, the best material for nuts is some sort of bone, but high grade plastics are also used. In any case, the density and malleability of the nut is relatively equally subject to being worn out by string vibrations. Think about it - hitting an open note with a thick pick is what gets you the most volume with an acoustic guitar, it's also what causes the most vibrations on the perimeter of the nut, which is what wears the thing out. If the groove in the nut is too big due to wear, your notes will THUD instead of RING, and your audience or yourself will not appreciate your music so well. It's got to be replaced, and can you make such a fine precision piece yourself? Not unless you're a machinist or master acoustic instrument repairs person you can't. Now the saddle is liken unto the nut in that the strings must cross it and vibrate across it. Fine instruments always feature some kind of bone nut and saddle, and it's best to have some sort of bone for the bridge pins too - if you've a solid wood instrument that doesn't have bone nut, saddle and bridge pins, then you can only improve the volume, tone, and sustain of your instrument by getting them installed. Surely the saddle is less inclined to damage and wear than is the frets or the nut, but they do wear out just the same, and whenever someone has their nut replaced, then it's typical that they have their saddle replaced as well. Now, you might be thinking that if I know so much about these things, then I should have just shot my own pictures and uploaded them - well, I might do that, but the nut picture already had edits on it that explain things perfectly wonderfully, but perhaps my bone bridge pins and saddle could have been photographed, and maybe it will be - but my frets are not damaged so I still needed some damaged ones in a photo to show to you - and that leads me to what this article is all about - expert repairs. My old Santa Cruz guitar got played fairly heavily during some periods of years, and it was used when I got it in the first place, my Santa Cruz model D is a 1984 model, the one hundred and thirty first guitar that The Santa Cruz Guitar Company had ever made - and at one point I had to have repairs done to the thing so that it would sound and play correctly. I'd asked a man in a nearby small town about doing the job, and he quickly surmised that I had a very fine instrument to be repaired, and he suggested that I take my guitar to someone he considered superior to anyone in the area, and so of course I did so. John's work, an old Martin - before and after. Hand built acoustic guitars, mandolins, Irish bouzoukis and expert repairs. 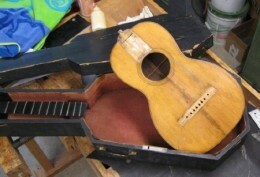 John Fitzgerald - Master Acoustic Instrument Repairs. So anyway, I was given the name and number of John Fitzgerald in Dallas, Texas; I called and arranged to bring him my Santa Cruz guitar, and I've not had problems with it since - but keep in mind the reason I've not had more problems of the exact same kind is that I've not been playing it anywhere near enough. It's just the nature of the guitar that the more you play it, the better it sounds - but the more likely it is to developed rattles, pops and buzzes that need to be addressed in order for it to keep that expensive guitar sound. Mr. John Fitzgerald replaced a few frets, and addressed the set up issues by making a new bone nut and bone saddle and installing them for me. Very friendly business like guy who loves guitars and mandolins, and I recall his wife being very friendly as well. I'd do business with this man again and will when I need it, and I recommend him and his services to anyone anywhere in the world with a great acoustic instrument that needs repairing. I believe that the pictures of that beat to hell old Martin over to the right, and his work on that should show you the kind of work that he can do - and if you have an instrument like that - then it doesn't matter where in the world that you are, you could ship it to John and have him restore it for you. John Fitzgerald also makes his own guitars - that's what people like him do, and Perretta instruments are surely some fine instruments - check out his website and order your own custom built guitar by this master luthier whenever you wish, or e mail the guy and ask questions - he's the man so far as I'm concerned. In any case, whether you need acoustic instrument repairs or not - I hope there has been some information in here that has been useful to a reader, and if I can personally help you with anything so far as understanding something about this subject or others, let me know. The Cowtown SJ - Perretta Guitars. In the world of acoustic guitars and acoustic guitar building there are many rising stars who make their own instruments and who try as hard as is humanly possible to create a musical instrument of wood and steel strings that is itself a work of art that someone can then appreciate for it's fineness, and use it to create music that is yet another art form altogether. These guitars of tremendous quality often have prices that reflect the long painstaking process of converting slabs of wood into things of sheer beauty - and only persons that do not understand that process and the joy that the product brings to it's owner, and then is transferred on to the fan of his music - all from the joyful hands of the instrument's creator - can not understand why these instruments nearly always cost several thousand dollars. So here at this time, John Kingslight has yet to produce even his fiftieth Kingslight guitar. But Mr. John Kingslight has been building guitars since 1980 - with another small guitar company - Dillon Guitars. He says his aim is to build the "perfect guitar" and with that sort of goal, the man certainly has to have some drive. There are more small guitar companies in the USA and other Western Nations now than ever before - and there are a LOT of them who have demonstrated the abilities required to make instruments every bit as good or even better (it's a matter of opinion) than the Golden Age classics by C.F. Martin and Co. and the Gibson Guitar Company. But John Kingslight is more than just a guitar builder - he's a minister, and a school bus driver - and he does those things because he loves people, and is attentive to their needs. With less than fifty Kingslight guitars built and sold - it's not strange that I've never seen one of them - but from what I can see and hear online, it's clear that Kingslight Guitars are going to be something that become more known than they now are - and who can say whether or not they'll be the next "holy grail" or Stradivarius type instruments in the days to come? 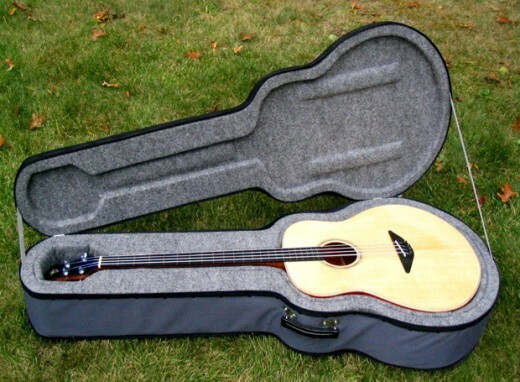 A Kingslight Acoustic Bass Guitar! With such a small, but obviously up and coming company as Kingslight guitars - there's not a specific model that I'd want to discuss; and as stated - I've never even seen one. I can, however definitely cast a worthy vote in the direction of Kingslight from having seen many photos and heard the sound of the instruments in videos. Though Mr. Kingslight has yet to produce his fiftieth instrument under the Kingslight name - he's apparently made at least one of most every type of instrument - which serves to show that what he does and can do is not just a one of type of craftsmanship - but an across the board set of skills, rather, is what he's got to display. 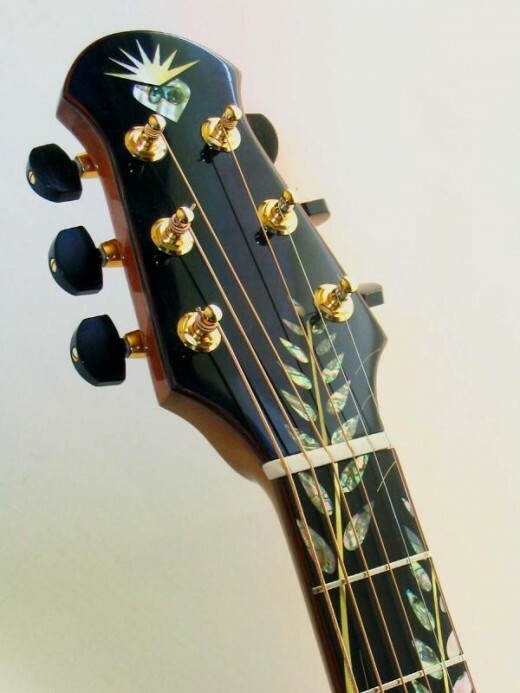 The photo below of a Kingslight guitar head stock shows some beautiful abalone inlay which extends either into or from - depending on how you look at it - the head stock to the fingerboard. Let me assure you that nobody bothers to learn how to do things as beautiful as that until they've mastered already the guitar building part of the journey into Lutherie. The Beautiful Kingslight Guitar Headstock and Abalone Inlay. Kingslight Guitars are based out of Washington State, near Seattle. From the official Kingslight Guitar website you can either place an order for a guitar, or see what is in stock. Please be advised that ordering an instrument such as these - simply isn't something you can do in the Fall and expect to have done by Christmas - we're talking building a work of art here, and it can take quite some time to build a perfect guitar. In any case - I'm already excited about these guitars, and I hope to get to put my hands on one someday. If you are in the market for having a custom built guitar - then be sure to check out Kingslight guitars before you place an order somewhere else. 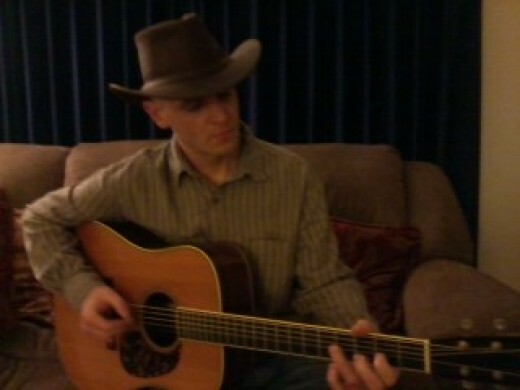 Erik Mongrain Playing a Kingslight Guitar. David Bromberg, Guitars, Fiddles, and Storytelling. The Martin D 15 Guitar. A Great Value, The Affordable Martin Guitar. 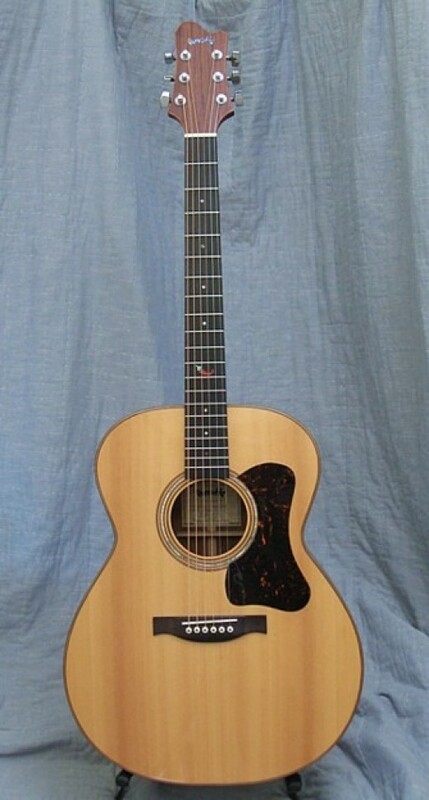 The Martin 00 - 17 Guitar.